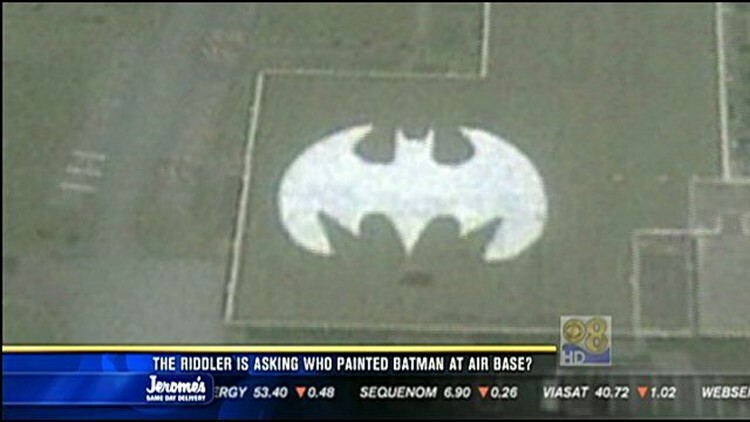 The Riddler asks, who painted Batman on air base? (CBS 8) - Amazing aerial shots discovered by Google Maps show a symbol of superhero proportions on a U.S. Air Force base. Riddle me this: what military branch is working with batman? It appears from an office building in Kadena, Okinawa that the U.S. Air Force base in Japan is in cahoots with the caped crusader. "I think it's kind of funny. What a silly thing to do," San Diego resident Terry Eller said. All jokes aside, the nearly 100-foot famous emblem was painted on the roof of America's 44th Fighter Squadron "Vampires" building to reflect their nickname -- "The Bats". "It's pride in their squadron, they want people to know what's going on! They've got attitude, that's what you need to be a fighter pilot, right?" San Diego Scott Goligoski said. Officials at Kadena Air Force Base laughed off rumors that the white-washed insignia was meant to scare off criminals from the sky, but were quick to point out the superhero structure does not pose a security threat. "What if they did that on our hours, you know what? Those guys work hard, they risk they're lives. They can do what they want. I think it's great," San Diego resident Debbie Patton said. While it's now being dubbed the ulitmate in call signs, it's also prompting many to fire up their computers to see if Google Earth can catch the Dark Knight at the same bat time, same bat channel. "I think it'd be fun to see it. And I'll probably tell people about it," Patton said. As for any other special symbols floating around the base, Batman isn't alone. There is a fighting rooster painted just a few doors down representing the 67th Fighter Squadron.